Unity today announced that it was collaborating with Havok on two physics solution for the engine. The first is Unity Physics, a new package written entirely in Unity’s high-performance C# code. While the second is a full integration of the flagship Havok Physics into Unity. 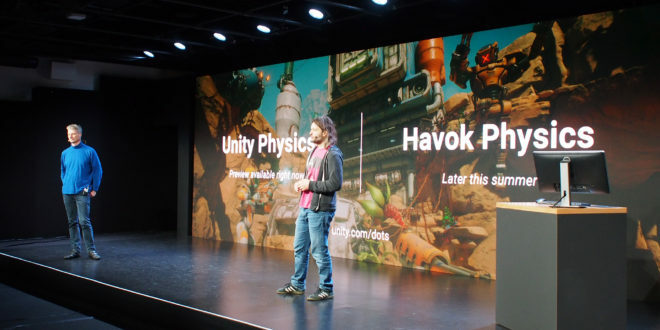 Havok’s Oliver Strunk appeared on stage at the Unity keynote to say: “We’re very excited to show how Unity and Havok can work together to push physics to the next level." The companies have apparently only been working together for a few months, but the results are already impressive. Strunk said that Havok, like Unity, had been on its own journey, “from an object-oriented model to a data-oriented one, giving users more control. And with that experience we were able to work with Unity on a new data format in C# that describes physics in a clean and simple way." He added that he was impressed with the performance of Unity’s C# code and burst compiler. While Unity Physics will be sufficient for many titles, it’s not going to work for everything. "We also wanted to make the power of Havok physics available inside Unity," said Ante. 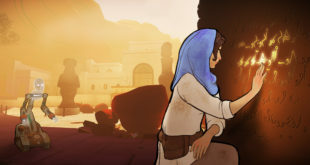 With Strunk adding that: “With a simple switch you can go from Unity Physics to the Havok engine, everything else can stay the same: game content and scripting." The pair then showed an impressive demo, using Unity’s own FPS demo from last year as a basis. They have fun spawning huge numbers of objects and knocking them about with a force gun. It ends with a huge washing machine filled with ragdoll bodies, spinning around while they bounce about and fly out. Its genuinely impressive stuff, and shows that Havok can be easily integrated into existing Unity projects. Unity physics is available as a preview package today. While Havok Physics will be available “later this summer”.